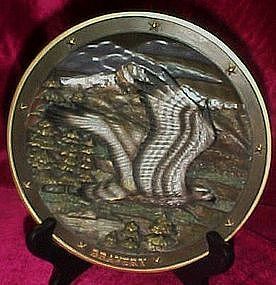 Plate #7 "Spirit of Bravery" last plate in the Sovereigns of the sky series from The Bradford Exchange. This is the beautiful osprey and taken from an original sculpture by Gene Dieckhoner. Below on the front, is the word BRAVERY. The 3-D sculpture makes this an amazing series of plates. Measures 7 1/4" in diameter and has never been displayed. Complete and ready to hang, it comes in the original box with certificate of authenticity. Retired in 1996. Attention all cat lovers.. this kitten is too adorable to resist. 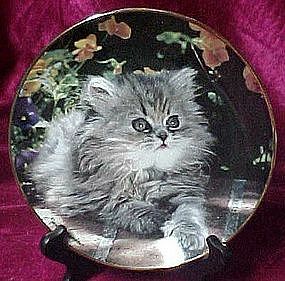 A lovely fine porcelain collectors plate from Franklin Mint. Plate is titled 'Room for One More' by Nancy Matthews. Limited edition plate is hand numbered, with real gold trim. Never displayed perfect condition! Comes with certificate of authenticity and styro box. Her plates are selling upwards of $60.00. I will be listing others of hers. Attention all cat lovers.. this kitten is too adorable to resist. 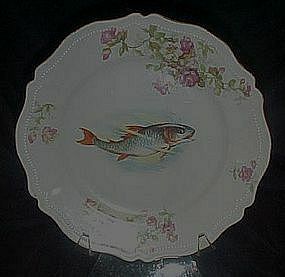 A lovely fine porcelain collectors plate from Franklin Mint. Plate is titled "Best foot forward" by Nancy Matthews. Limited edition plate is hand numbered, with real gold trim. Never displayed perfect condition! Comes with certificate of authenticity and styro box. Her plates are selling upwards of $60.00. I will be listing others of hers. 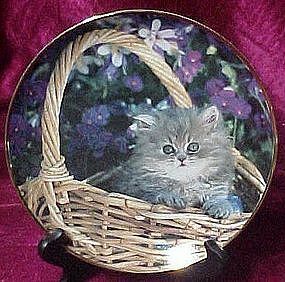 Franklin Mint limited edition collector plate, Shi Di. From Diana Princess of Wales collection by artist Drew Struzan. Bears the signature mark of the artist. Heirloom quality plate, has never been displayed and comes with all paperwork and certificate in original styro box. Measures 8 1/8" in diameter with real platinum trim. 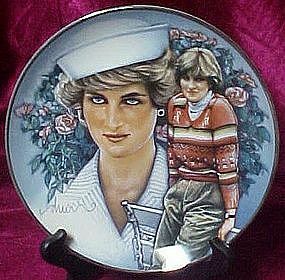 You will love this plate, and the incredible likeness to the Princess. The first issue in the World War II: A Remembrance Collection by Jim Griffin. 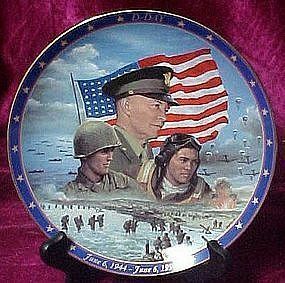 This plate portrays the 50 year anniversary of D-Day, June 6,1944- June 6,1994. Limited edition by the Bradford Exchange. 8" diameter – Excellent Condition and includes box and Certificate of Authenticity. Tiara coral Empress Basket decorated with an impressed Bird of Paradise. A wing of each bird incorporates into making the handle of the basket. Tiara Exclusives came into being on July 1, 1970. It was strictly a retail outfit, as they didn't manufacture any glass. 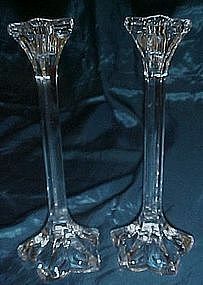 The Indiana Glass Company started Tiara to capitalize on the home party craze. Measures 7 1/2" high and 6 1/2" wide. No chips or cracks. Pristine condition. This looks like a Viking piece in the Epic line. Varigated brown & green taffy color cased in a clear green glass. Four stretched petals meet at the top making this a great flower frog vase. Measures 17" tall and is in perfect condition. Ground pontil. A UNIQUE AND WONDERFUL PIECE! 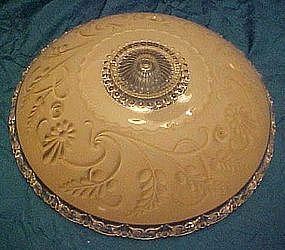 Take a look at this beautiful vintage celing shade. Suspended by three chains. (I have 2 of the little chains). Gorgeous peachy pink reverse color over clear glass. Raised detailed flowers and ferns. Scrolled and beaded border of clear glass. 15 1/8" diameter. Perfect condition with no chips and no scratches to the coloring either. A beautiful vintage piece to restore your old home. Nice large depression pink fruit bowl with large fluted scallop edges. Pattern fades to smooth glass along the fluted flare edges. 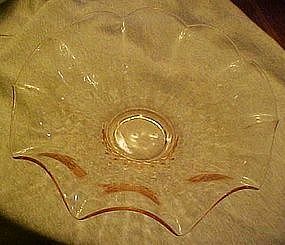 This appears to be a variation of the jeanette Glass Windsor diamond pattern. Pristine condition with no scratches, chips or damages of any kind. 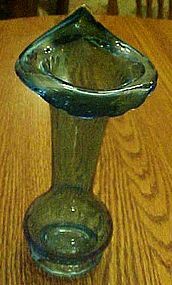 Measures 11 3/4" in diameter and is 4" tall. I have a closeup of the pattern if you would like to see it. Just email me. Adorable hand painted Wriggles the rabbit cookie Jar. 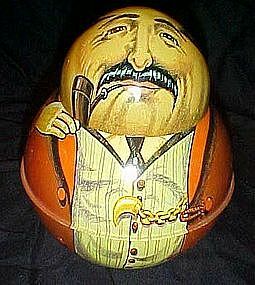 Made of hand painted glazed ceramic, he appears to have a wicker texture. 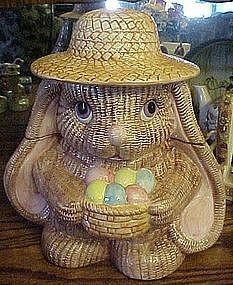 He wears a big straw hat and holds a basket of Easter eggs, He has long floppy ears and big blue eyes. Made by Metro in 1994. He has never been used and is still in the original box. The box has some issues, but has protected Wriggles over the years. Measures 11" tall and is perfect and like new. Beautiful, tall, and elegant lead crystal candle sticks by Mikasa in the Petals pattern. Measures 9" tall and both are in perfect condition. Sold as a pair for this price. Candleholders. 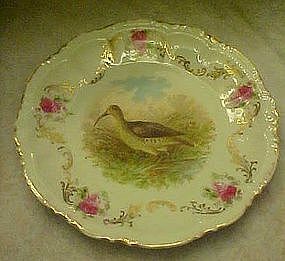 Nice cabinet plate with a bird, which appears to be a sandpiper. Scalloped edges with beaded border and relief on the edges. Gold swags and trim and embellished with dark pink roses. Measures just over 9" in diameter. No chips or cracks and gold is 98% good. Mark on the back is blurred but is a green wreath with an M, which may be Noritake or Nippon. I can't read it. This is a wonderful wildlife bird plate. 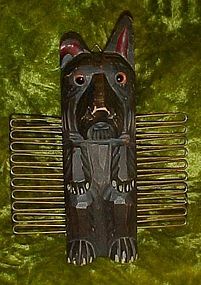 Old hand carved wood scotty dog is made to hang on the wall and hold your ties or scarfs. Wonderful condition and has real glass eyes. Measures 7" tall. Paint and stain is wonderful, just a rub on the edge of his nose. Hanger on the back is intact too. I think it's cute how his little ear appears to be flopped over, and begs to hold your ties. Take a look at this gorgeous turquoise blue jack in the pulpit vase. Hand blown art glass with control bubbles creating an interesting design factor to the vase. Measures 7 7/8" tall and is perfect in every way. pontil scar on the bottom. Fenton lavender satin glass swan. 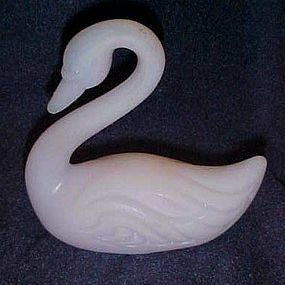 Hard to get a good picture of this swan showing its real color but it is lavender satin glass. This swan is very hard to find and is in excellent condition. 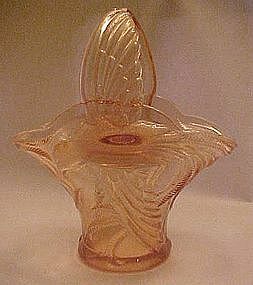 made by Fenton in the early 1970's. No sticker.